This post is for and about my dad, my family and traditions, both those that are “mine” and what traditions mean to me in general. 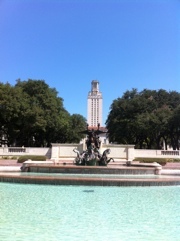 Yesterday was the first day of classes here at the University of Texas at Austin. I worked in the morning at the PMA library and was… oddly disappointed. With a student body population of around 50,000, I expected there to be a lot more hustle and bustle, but the campus was quiet and peaceful in the early-morning heat. When I wrote recently about why I chose to come to UT, I rather half-heartedly mentioned the fact that I am now the third generation in my family to come to UT. To me, that’s more than just an idle statement and it’s something that becomes more meaningful to me as I listened to the speakers at the annual Gone To Texas (GTT) ceremony. I chose to go to Oxford because it was the best place to do what I wanted to do, and I still feel incredibly lucky that I got to live childhood!me’s dream of going to Oxford. When I went to Oxford, one of the things that constantly struck me was the thread of world history that now connected me to all the other Oxonians around the world and throughout that university’s history. I became part of a staggeringly amazing group of alumni — Wikipedia helpfully lists a number of the most famous. The traditions of the university became very dear to me and I relished wearing my sub fusc and reciting the Bodleian Library’s oath. The University of Oxford crest adorns the base of the Tower. Many of the Oxford traditions (for better or for worse) stretch back centuries and it still makes me smile to think that for a little while they were part of my daily life. 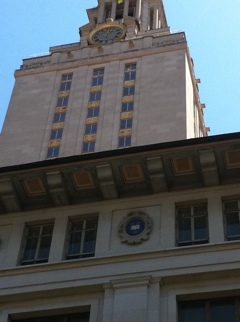 Even at UT, respect and admiration for the world’s oldest universities is prominently acknowledged on the sides of the UT Tower where the crests of the Universities of Bologna, Paris, Oxford, Salmanca, Cambridge and Heidelberg have been placed. We may not dress in sub fusc or swear oaths to our libraries, but clearly the dons of UT’s past wanted our university to be part of the list of elite institutions of the world. 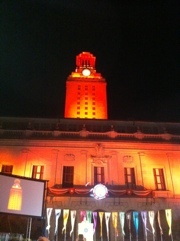 The Tower is lit up orange for sports victories and special occasions. While the Oxford traditions connect me to the thread of the world’s history, the traditions at UT connect me to the thread of my own family. My father and grandfather were Longhorns, as were a number of my other relatives. My dad raised me to be a Longhorn, too, and I remember many walks along “The Drag” with him telling me about all the most interesting places on campus. One of my favourite memories is of going to see the UT college maces on display in the Student Union. Even though I may have taken some of his advice with a grain of salt (“you have to live within five blocks of campus! !”) and although I joke about his finally getting to use that “I’m a Longhorn Dad” bumper sticker, I am glad I’ve finally followed in his footsteps and given him an opportunity to give it. I’m not sure if my graduation from UT will mean as much to him as my graduation from Oxford, but it will mean as much to me. The Longhorn Band plays the Fight Song. If my fellow new iSchoolers are anything to go by, it’s very uncool to be patriotic about your graduate school. Perhaps this is a valid way of looking at things, especially since you can’t go just anywhere to study libraries and archives. 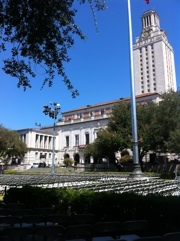 But at the Gone To Texas evening, I couldn’t help but feel very emotional about the fact that when I walk around campus and hear the 56 great carillon bells playing, they are being rung by the same man who rang them when my dad was a student in the 1970s. Maybe it’s because my undergraduate university was so young and had so few traditions, but I’m thrilled to bits to show my school spirit and have the eyes of Texas upon me. I feel very lucky that the program that is best for me (and best in the country) happened to be at a university I’ve wanted to go to since I was little. Again. 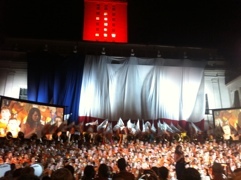 I am proud to be a Longhorn. I’m proud to throw up the horns and say ‘Hook ‘Em.’ I’m proud to continue a family tradition.